Here's a tactical knife for the professional that is overbuilt to last. For those who have a need to use it, this is as much defensive security as you can find in a tactical folder. The blade shape is a classical Samurai design which gives outstanding penetrating power as well as exceptional slashing performance. We have used our premium AUS 8 stainless steel for the optimum in strength and edge-holding ability with very good stain resistance. For rapid deployment, OutBurst assisted opening mechanism instantly springs the blade fully open after you have opened the blade approximately 30 degrees. To meet jurisdictional regulations, the OutBurst mechanism can be quickly disabled with a single setscrew. As the blade is opened it locks automatically with CRKT's AutoLAWKS safety. This makes the Hissatsu Folder a virtual fixed blade, which is important in high-stress rapid-deployment situations. 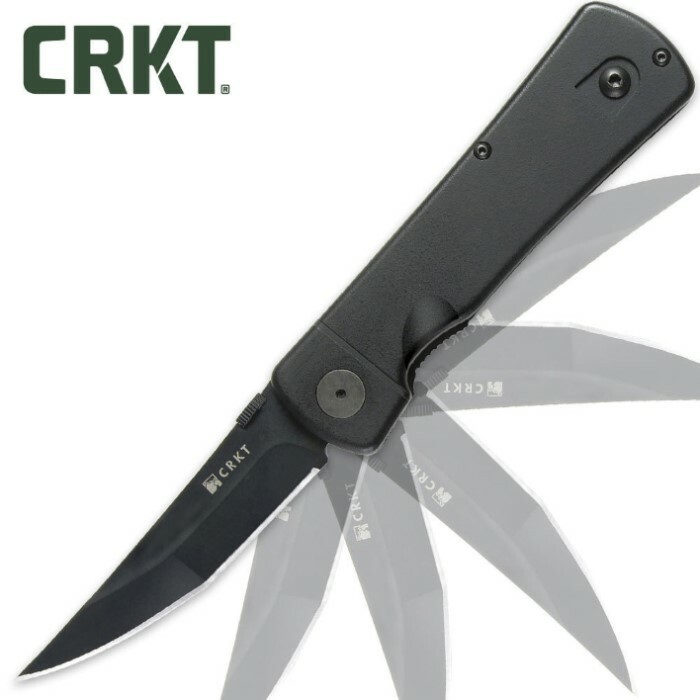 Other features include a heavy-duty version of CRKT's stainless steel InterFrame built with beefy 0.059" 420J2 stainless steel liners, one locking, and black Zytel scales, textured to provide a secure grip. A thumb disk allows rapid opening with either hand, and the custom Teflon-plated stainless steel clip can be quickly and easily mounted right- or left-handed with a single screw, yielding a knife that is truly ambidextrous. 3 7/8 in. blade, 8 3/4 in. overall. This knife is perfect it does what it's designer intended . To respond to the gentleman who states it's difficult to open. It's designed to take some pressure to open so it doesn't open in your pocket. Once you get past that point it opens quickly. It's not meant for people with arthritic hands you need a strong hand and grip to use the knife. It was designed for military use. I don't know of any in the field that can't use a knife like this . It's sharp and holds an edge well . A very deadly knife with a peculiar flaw. The point is like a razor-sharp nail. It's the expert grinding that's the secret. The blade is just curved enough to make it a very nasty slasher. The flaw is that it's incredibly difficult to open. Its got a huge spring inside for the "Outburst" opening system. But there is an answer. The spring can be removed by removing one screw. You will need a #6 Torx driver. Inside the base of the knife you will find a set screw holding the spring in position. The spring goes through the base of the knife. Loosen the screw and the spring will slide out the bottom. Then with a little practice and a little lube, it will open as fast as a switchblade. Decent knife but the assisted opening mechanism seems a little tough to get started. Have arthritis in both hands and thought this would be easier to open over a thumb-stud. I was wrong. Anyway, outside of that the knife will definitely do what it was designed for. All I can say is wow. This knife is really nice. I had a hard time at first opening it, but after a while got it down. I'm going to assume they're all like that considering most reviews i found elsewhere have stated as such. As someone that studied the martial arts, I have to say the blade design is nice, obviously meant for penetration. You can hold it in just about any grip style you choose. Definitely for self defense purposes, granted you could use it for EDC. The blade locks very securely too since it has a dual locking mechanism, preventing the blade from closing on your fingers. It's a decidedly tip up design with a reversible pocket clip. I haven't tested the sharpness, but I can safely gauge that it comes sharp enough. The weight is fairly decent on it, the balance can be found in the handle. The weight distribution to me at least reminds of a full tang blade. The indention where the thumb disk is make for a nice secure grip in the hands. Overall a very nice knife and worth every penny. I also suggest buying the Kershaw Tension and Speed assist tool if you want to go right to work on removing the outburst spring from the knife, after all everyone has their preference, and having the tool is nice for your other auto assisted knives. Agree with first reviewer. This knife is perfect for those uneasy social situations. Excellent spring and lockup. This knife was chosen by a certain unnamed special ops unit for wet jobs according to my boyfriend. Tip- When not using the knife, keep blade open for longer spring life. This is a small sword. Be ready for a BMF! Very task specific, slice things you don't like.